This entry was posted in Bliss Tips, Child's perspective, Children's Art, Kids Art, Planting Seeds and tagged Children's Art, crayon drawings, Gallery, Grandchildren, Grandma, magnets, Painting, Refrigerator, Sneaking Bliss, Tips by MaryALivingston. Bookmark the permalink. Mary you are so right, refrigerators should have a magnetic panel for grandmas. It is the best place for all artists of all ages and their photos to be with us as we work in our kitchens. Mine is full of memories. So true. Ours have to be on the side. I much prefer my gallery on the front. A place to hang reddy dog pictures too! Yes, They most certainly are in the bliss category! 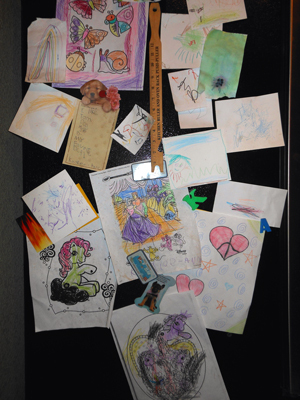 The origin of new artists appear on the refrigerator. I love this blog.